[178 Pages Report] The global adhesion promoter market was valued at USD 2.51 Billion in 2015, and is projected to reach USD 3.64 Billion by 2021, at a CAGR of 6.4% between 2016 and 2021. The global adhesion promoters market has been categorized on the basis of type, application, and region. In terms of value, the silane segment led the global adhesion promoter market in 2015. The market is categorized on the basis of application into plastics & composites, paints & coatings, rubber, adhesives, metals, and others. Innovations in advanced composites and multilayer packaging have increased the demand of adhesion promoter in the plastics & composites application. The adhesion promoter market in the Asia-Pacific region is projected to grow at the highest CAGR during the forecast period, owing to the rising demand of paints & coatings in the automotive and construction sectors. The report on the adhesion promoter market considered 2015 as the base year, and the forecast period from 2016 to 2021. The research methodology used to estimate and forecast the global adhesion promoter market begins with capturing data on key vendor revenues through secondary research. The vendor offerings are also taken into consideration to determine the market segmentation. The bottom-up procedure was employed to arrive at the overall market size of the global market. After arriving at the overall market size, the total market was split into several segments and subsegments, which were later verified through primary research by conducting extensive interviews with key personnel, such as CEOs, VPs, directors, and executives. This data triangulation and market breakdown procedures were employed to complete the overall market engineering process and arrive at the exact statistics for all segments and subsegments of the market. The breakdown of profiles of primaries is depicted in the figure below. 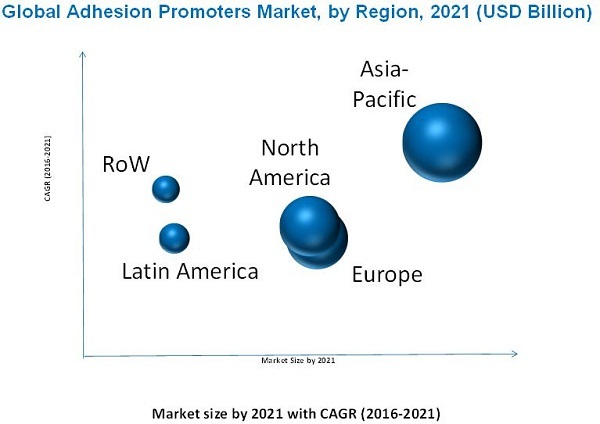 The adhesion promoter market has a diversified ecosystem of upstream players, including raw material suppliers, along with downstream stakeholders, vendors, end users, and government organizations. Key players in this market include Momentive Performance Materials Inc. (U.S.), Eastman Chemical Company (U.S.), Dow Corning Corporation (U.S.), BASF SE (Germany), Arkema SA (France), Evonik Industries AG (Germany), ALTANA AG (Germany), Air Products and Chemicals, Inc. (U.S.), E. I. du Pont de Nemours and Company (U.S.), and AkzoNobel NV (Netherlands), among others. The government and research organizations, raw material suppliers and distributors, construction companies, and industry associations are considered as critical stakeholders in this study. Scope of the Report: This research report categorizes the global adhesion promoter market on the basis of type, application, and region; forecasting volumes and revenues as well as analyzing trends in each of these submarkets. The global adhesion promoter market was valued at USD 2.51 Billion in 2015 and is projected to reach USD 3.64 Billion by 2021, at a CAGR of 6.4% from 2016 to 2021. This growth is mainly attributed to the growing automotive sector in the Asia-Pacific region, use of adhesion promoters in composites, application of adhesion promoters in printed circuit boards, innovation of silane-based green tires, requirement of halogen-free wires, and development of multilayer packaging. Among all applications, the plastics & composites segment is the fastest-growing application segment in the adhesion promoter market. Adhesion promoters are used to produce silica-reinforced tires. They are also used to develop high-molecular-weight rubbers and highly weatherable paints. In chemical applications such as paints & coatings and adhesives, adhesion promoters are used to increase adhesion with inorganic substrates. They assist in increasing transparency and reducing viscosity of coatings during mixing of paints & coatings. In electrical application, adhesion promoters are used to improve the reliability of semiconductors and flat panel displays. They also help in improving the adhesion and dispersibility of inorganic materials. Moreover, in the construction sector, adhesion promoters help in improving the durability of exterior walls of buildings, bridges, and other infrastructures. A wide range of adhesion promoters are available in the market. Silane is the major type of adhesion promoters used in paints & coatings, rubber, and tire applications. It is also utilized in the automotive and construction industries. Maleic anhydride is the second-largest type of adhesion promoters. Its major application is in plastics & composites. It is also used in packaging, automotive, wire & cable, and recycling industries. Asia-Pacific held the largest share in the global adhesion promoter market in 2015. The market in this region is projected to grow at the highest CAGR during the forecast period, in terms of value. This growth is mainly attributed to the increasing demand of adhesion promoters in the paints & coatings application. Several global players in the adhesion promoters market are establishing their manufacturing base in the Asia-Pacific region, owing to the easy availability of raw materials and labor. Factors inhibiting the growth of the global adhesion promoter market include negative environmental impact of some adhesion promoters and the underdeveloped recycling industry in the Asia-Pacific region. Momentive Performance Materials Inc. (U.S.), Eastman Chemical Company (U.S.), Dow Corning Corporation (U.S.), BASF SE (Germany), Arkema SA (France), Evonik Industries AG (Germany), and ALTANA AG (Germany) are key players operating in the adhesion promoter market. Momentive Performance Materials Inc. (U.S.) is engaged in the production of new products in the field of adhesion promoters market. The company has also undertaken collaboration activities to improve growth opportunities in emerging markets. 11.9 Air Products and Chemicals, Inc.